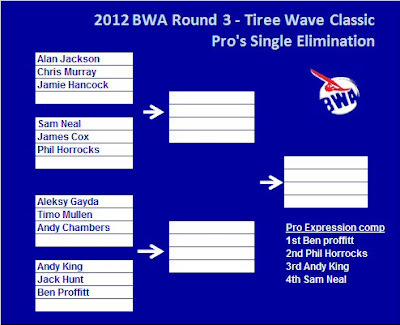 Tiree failed to deliver conditions big or long enough to run Pro elimination heats. However, Balephuil served up some impressive waves and hosted a Pro’s Expression competition.Reigning champ Ben Proffitt beating the 2012 tour leader, Phil Horrocks into 2nd. Cornwall hero Andy King closely behind with 3rd and Sam Neal a well deserved 4th. The Event hosts correctly awarded the 2012 Tiree Wave Classic titles. In accordance with the compeittion rules, the BWA will not be counting the result into the overall Championship table meaning the field remains open going into the final round at Cornwall. Ladie’s Double. Only 1 round completed with Tucker and Robson advancing for a valuable 5th place. Places 1 through 4 remain as per the single giving Debbie Kennedy a well deserved 1st place. Sophia Gilje snatching 2nd in only her 2nd year of competition. Leading lady, Justyna Sniady battled gained a critical 3rd place despite recovering from a broken foot. 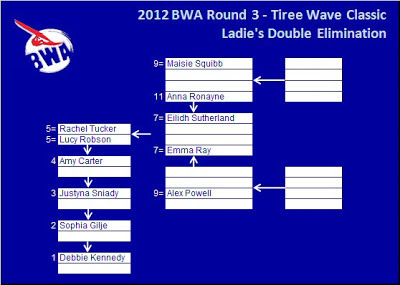 All to play for in the final event with only 2.3 point seperating the top ladies. Whilst the double elimination got underway on the 6th day, the wind dropped mid heat and never returned. The standings therefore remain as per the single elimination. The big Scot, Davey Edmiston gave all he had to earn his 3rd Tiree Master’s crown. Big Davey was so exhausted he never made the prize giving and was later seen curled up in a dying ball on the returning ferry! 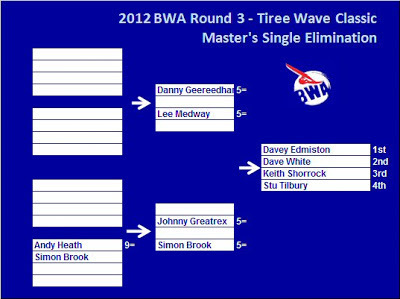 Dave White finished 2nd to move further away from the rest of the Masters fleet in the Championship table. The title is all but won for him. Another tremendous result for the Scottish representatives with Tris Levie battling hard against the leading UK Youth wavesailor, Luke Raistrick. Tiree local boy Stewart Cowling sailed consistently well to finish 3rd. the other Scot, Matteo Biazotti struggled to repeat his amazing win in the 4th round finishing 4th. Head Judge, Mark ‘ Sparky’ Hosegood commented that he sees all 4 youth as future contenders for the pro titles. The amateurs event produced one of the fiercest battles with a massive grudge match between Alfie , Ian, Scotty and Tom. After an appalling result in Wales where Ross missed his final heat by error he needed a win against the leading Am’s sailor, Alfie Hart and he pulled everything out to produce a performance that was worthy of a pro to take 1st place. Local Scot, McDowell, a previous Tiree Champ had to settle for 3rd with Tom taking a great 4th. 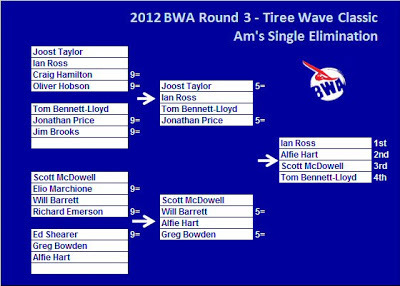 Only 1.9 points separate Alfie Hart and Ian Ross as we go into the final round next week at Gwithian.